John Lewis has built one of the most loved retail brands in the United Kingdom. People are attracted to the John Lewis Brand because of its purpose, core values, unique business model, emotional advertising and employees (partners) who deliver a great customer experience. The John Lewis Partnership is an employee-owned company which operates John Lewis department stores and Waitrose supermarkets. The company is owned by a trust on behalf of all its employees — known as Partners – who have a say in the running of the business and receive a share of annual profits. John Lewis is one of the largest private companies in the United Kingdom. The John Lewis Partnership puts the happiness of Partners at the center of everything it does. The goal was to create a different type of company owned by Partners dedicated to providing customers with great service. Happy empowered employees with ownership in the company who have a vested interest in providing high levels of customer service. John Spedan Lewis formed the partnership in 1929 and began distributing profits to employees. His goal was to create a company that gave every Partner a voice in the business they co-own. His combination of business acumen and corporate conscience was ahead of its time. The Partnership’s ultimate purpose is the happiness of all its members, through worthwhile and satisfying employment in a successful business. The Partnership is owned in trust for its members, they share the responsibilities of ownership as well as its rewards profit, knowledge and power. They have won a number of awards as Britain’s favorite retailer because they provide a better customer service experience than their competition. Their advertising including this years holiday campaign builds a strong emotional connection with consumers. None of the 70,000 people who work at John Lewis is an employee. They are “Partners” who jointly own the business. They earn profit-sharing based on how much profit is generated by the business. This encourages them to give great service because they feel a sense of ownership. John Lewis believes that if you treat your partners well, it will lead to good customer service. Allowing Partners to think for themselves gives them a sense of responsibility – which, as a rule of thumb, they tend to want to live up to. John Lewis involves customer facing staff in improving the way things are done. They leverage their unique insights to improve service. Partners at John Lewis have strong product knowledge and embrace every opportunity to provide great service. John Lewis has a user-friendly website. They also make it easy for customers to contact a real person as soon as they want to. Can you think of another retail brand where employees “live the brand” and create a great customer experience? My daughters will be entering college in the fall of 2015. On Saturday, we visited Manhattan College in the Riverdale section of the Bronx. We attended an information session followed by a campus tour. We were all very impressed. It was a great experience. Manhattan has a great story to tell. Students and faculty told the story in a way that connected emotionally with the audience. Their passion and enthusiasm was refreshing. They lived the Manhattan College Brand. 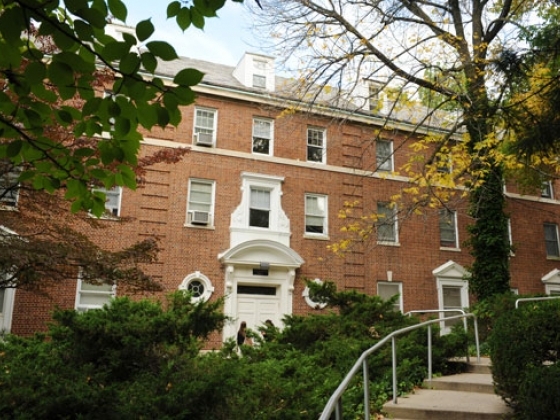 Manhattan College is a private, independent, Roman Catholic, liberal arts college in the Lasallian tradition. Manhattan College was founded in 1853 by five French Lasallian Brothers in a small building on Canal Street. Today, the campus is located on 22 scenic acres overlooking Van Cortlandt Park in Riverdale. The small intimate setting and layout of the campus is unique and provides many opportunities to connect with fellow students. It is a tranquil setting amidst the fast pace of New York City. Its proximity to Manhattan is a major benefit and selling point. The on-campus experience is one of the special things that differentiates Manhattan College from other universities. Famous Manhattan College Alumni include author James Patterson, former New York City Mayor Rudy Giuliani and New York City Police Commissioner Raymond Kelly. There are nearly 4,000 colleges and universities in the United States. In a highly competitive marketplace, colleges and universities have become skilled in brand marketing. Developing and managing the identity of a college is critical to the success of recruitment and development efforts. Brand identity plays an important role in helping schools secure grant funding, attract top faculty, and maintain strong community, government and media relations. From my perspective Manhattan College has done an excellent job defining and communicating the uniqueness of their brand. The promise of the Manhattan College Brand is rooted in Lasallian Catholic traditions of excellence in teaching, respect for individual dignity and a commitment to social justice. The goal of an education at Manhattan College is to teach you how to think not what to think. Manhattan’s tagline “DREAMS DELIVERED” helps bring the brand promise to life. Have you visited the Manhattan College Campus? What Ever Happened to Hathaway Shirts? The C.F Hathaway Company was founded in Waterville, Maine in 1837. The company made shirts for Union soldiers during the Civil War. The company built the ready to wear shirt business in the United States. For over 100 years, the company succeeded without advertising. In 1951, Ellerton Jette President and Owner decided it was time to expand Hathaway and build it into a national brand. Like other small business owners, he didn’t have much money. However, that did not prevent him from thinking big. He had heard about the advertising talents of David Ogilvy. So he scheduled a meeting with Ogilvy. Hathaway’s ad budget was only $30,000 so his account was not that attractive to major advertising agencies. He knew he had only one chance to forge a relationship with one of advertising’s most creative thinkers. To convince David Ogilvy to handle the account, Jette promised that he would never alter his copy or fire him. The agreement stood for over 20 years. Jette was smart enough to think beyond his own goals and understand the problems that advertising agencies face, clients that change copy and fire them at a moment’s notice. 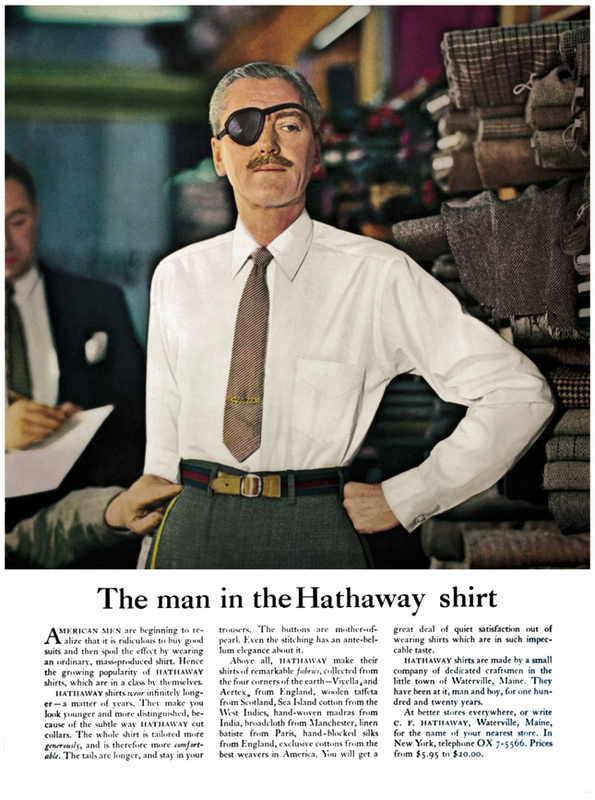 While working on the ad campaign, Ogilvy became inspired by photos of politician Lewis Douglas sporting an eye patch and as a last-minute decision at the photo shoot decided to photograph a distinguished looking man wearing a white button-down Hathaway shirt and a black eye patch. The eye patch was a great story and created an emotional connection with consumers. Consumers wondered how the man had lost his eye. The story of the “The Man in the Hathaway Shirt” advertising was very successful. When the ads ran in The New Yorker, Hathaway’s entire stock sold out. The company’s sales doubled in less than five years. The “Hathaway Man” campaign was selected by Advertising Age as #22 on its list of the greatest ad campaigns of the 20th century. I have owned several Hathaway white button-dress shirts over the years and appreciated their quality. It’s hard to find a Hathaway shirt today. The Hathaway Brand has struggled in recent years and has faded from most retail shelves. The brand has been sold several times. Its decline has been blamed on competition and the rise in the trend to casual wear. In 2002, Hathaway closed its manufacturing facility in Waterville, Maine. It was one of the last companies to manufacture shirts in the United States. From my perspective, Hathaway is an iconic American Brand with a great story. It seems time for a re-launch. Did you ever own a Hathaway Shirt?